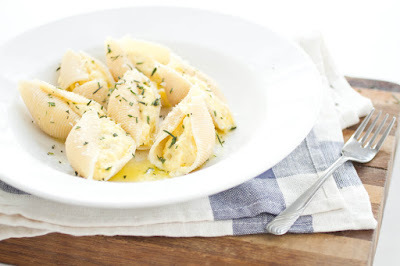 Roasted Acorn Squash Stuffed Shells | Naturally. There are times I spend a couple days dreaming up a recipe. This time it involved a pasta dish with roasted acorn squash. That’s all I had figured out. Originally it was going to be a ravioli pasta salad tossed with feta and roasted acorn squash seeds. Then it morphed into more of a dinner dish and I was going to make whole wheat ravioli. All of this was stopped when I realized I didn’t have eggs. I couldn’t make pasta. By the time I realized I didn’t have eggs, my mouth was already watering and I couldn’t stop. I found leftover shells when I was searching frantically through my cupboards. While not homemade pasta, it would have to do! 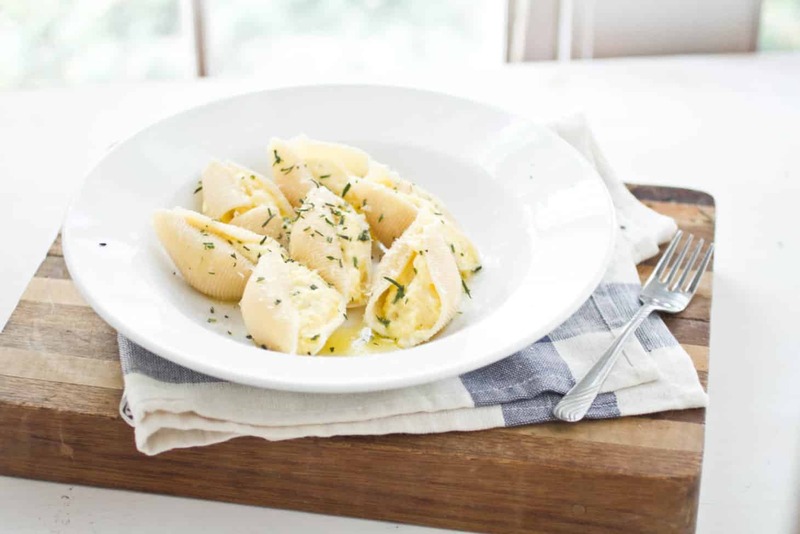 While I still plan on making this into a ravioli dish, using shells makes this a more accessible recipe for those who don’t want to make pasta. This recipe becomes even easier if you roast the squash the day before! As with all dishes, I recommend you buy organic butter. The flavor is so much better, especially when paired with fresh rosemary! Cook pasta according to package. You want it cooked to the point of where you would serve it but you don’t want it soggy! 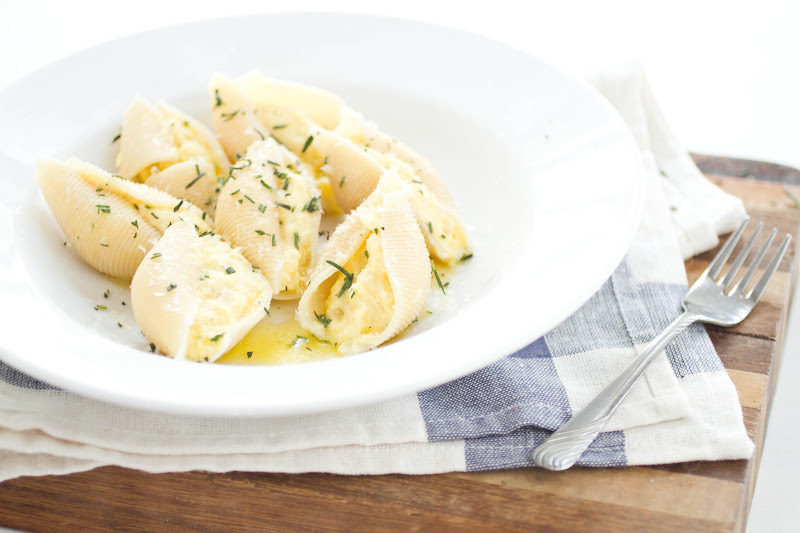 In a bowl, stir together the acorn squash, ricotta cheese and Parmesan. In a skillet, heat olive oil over medium heat. Finely dice onions and add to pan. Cook until onions are translucent and cooked through. Stir in the squash mixture and cook over low heat until warm. In a small skillet, heat butter and rosemary over low heat until ready to serve. Once everything is ready, spoon (or you can pipe) squash mixture into each shell and place in a serving bowl. 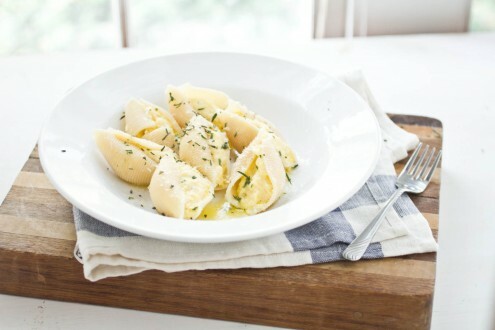 Once all the mixture is used, drizzle the butter over shells and finish with fresh grated Parmesan. Thank you, very interesting and tasty recipe! Love this. My mouth is watering. I have some squash just waiting to be used. Great pictures too! This looks wonderful! Can’t wait to try it! This sounds like comfort in a shell! what a great fall pasta dish! yum! mouth is watering. the end. These look delicate and delicious. They’re at the top of my “to do” list! Thanks for a healthy, seasonal and delicious-looking recipe. My local farmers market is full of beautiful squash this time of year! Made this for dinner tonight, only with brown butter to top it off. Fantastic use for my acorn squash I had sitting around on this dreary fall evening. Thanks for the great recipe. Sounds like my recipe for Thanksgiving leftovers last year. I make a mashed sweet potato cassarole with toasted pecans and coconut each year. Last year I made potstickers with the leftovers and served with a honey sour cream dipping sauce. I also froze some–no waste and yummy. I made this for my family and it went great with some rosemary roasted peppers and mushrooms. I also added in just a touch of garam masala. Yum! I can’t wait to make it again. Could you substitute for a different type of squash? This recipe wasn’t bad but I wouldn’t say that it was good enough to be worth the amount of time that it requires.